There’s nothing quite like a college to keep a town young and vibrant. 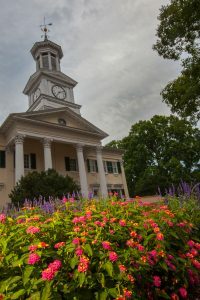 Located on 325 acres in the picturesque Shenandoah Valley and on the banks of the Potomac River sits Shepherd University – a public university in West Virginia. A West Virginia Act of 1871 established a State Normal School “at the building known as Shepherd College.” Offering postsecondary education to prospective teachers, Shepherd College was coed from the beginning, when it had only 42 students and one building. By 1874 Shepherd was serving 160 students and in 1930 it expanded to a four-year college. Today Shepherd has about 4,300 students and 36 buildings. Shepherd University, whose mascot is the Rams, was ranked as one of 2015’s Best Colleges. The university is a major influence in Shepherdstown, a town of 1,700. Visitors can take a historic tour of Shepherd University – more information here.